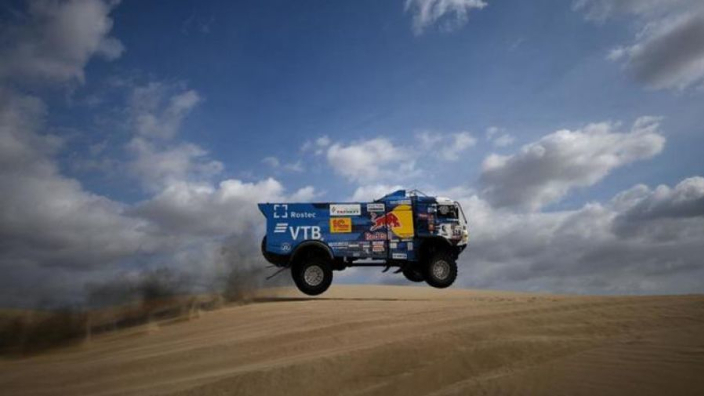 Russian driver Andrey Karginov has been excluded from the truck classification of the Dakar Rally after failing to stop and attend to a spectator that he had hit. The 60-year-old onlooker suffered a broken leg after being hit by the vehicle weighing more than three tons. Karginov was third in the Camion classification after five stages, two of which he had won for his Kamaz team alongside co-driver Andrey Mokeev and mechanic Igor Leonov. The 42-year-old won the truck class in 2014 after taking four stage wins and was on a fine comeback trail this year after finishing 14th in his last outing in 2016. However, his latest effort has been cut short after an incident on Friday's fifth stage from Moquegua to Arequipa in Peru. Kamaz boss Vladimir Chagin said that Karginov had, in fct, been unaware that he had even struck the South African spectator. He saod: "As he [Karginov] was driving up one of the ascents, there was a group of five spectators in the path of the truck. Four managed to clear off but one tripped in the sand and his leg was caught under the rear wheel of the truck. "Andrey naturally didn't see this - it was an ascent and all you can see through the windshield is the sky and the top of the mountain – so he only found out about the accident upon arriving to the bivouac." Another Kamaz team, led by Eduard Nikolaev leads the truck classification at the race's midway stage, having won the opening two stages and following it up with another win in Friday's. You can see the incident in the video below. Beware it, naturally, contains scenes some may find distressing.